When a guest is invited to join a team, they receive a welcome email message that includes some information about the team and what to expect now that they're a member. The guest must redeem the invitation in the email message before they can access the team and its channels. All team members see a message in the channel thread announcing that the team owner has added a guest and providing the guest's name. Everyone on the team can identify easily who is a guest. As shown in the following screenshot of a sample team, a banner indicates "This team has guests" and a "GUEST" label appears next to each guest's name. 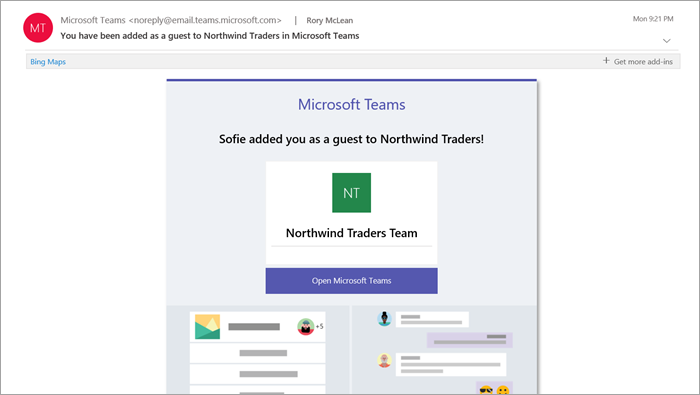 The following table compares the Microsoft Teams functionality available for an organization's team members to the functionality available for a guest user on the team. The following table shows the calling and meeting features available to guests. 1 This feature will be available soon. Office 365 admins control the features available to guests. Q. Do guests have the same capabilities as team members? A. No. For more information about what a guest can and cannot do, go to Guest capabilities in Teams. A. You can add up to 5 guests per licensed user. Q. Do guests have access to OneDrive for Business? Q. Do guests have access to SharePoint files? Q. Can guests search within files? Q. Can guests attach files? A. Yes, a guest can attach files in these two ways: •	Select Files in the left pane, and then browse to the file location. •	Upload from their computer. Q. Can a guest download a file in a private chat? A. Yes, they can receive a file from a member in a private chat, and then download it to their desktop.